Many people are induced by the stories about Sathya Sai to dwell again in the wonderful naive beliefs and hopes of childhood. I must admit to this myself, as I put aside many of my critical faculties in order to deepen myself fully in the Sai Baba story, teaching and practices for about 20 years. This was only possible for me, though fully trained in critical philosophical analysis and the methods of the sciences and the humanities, because of indubitable paranormal events that occurred in my life, seemingly in some unusual kind of connection with Sai Baba, many of which I described in my book Source of the Dream. Undoubted paranormal events had occurred to me before that, but the Sai Baba connection seemed to increase and deepen such experiences. Be that as it may, when I was forced - despite myself - to learn of Sathya Sai Baba's dark activities, I eventually had to defect from his organisation and reject him as a deceiver and major abuser of faith. As new facts came to light, a more critical attitude returned quite naturally with respect to the many stories that I had read eagerly before... some of which I had always felt uncomfortable about. As I investigated further on a less subjective, more neutral and fuller basis than before, I found more and more discrepancies in almost every aspect of the Sai Baba legend. Here follow some examples of the type of fantastic fables which cannot be checked and would defy all reason and common sense. The bottom line is that either onewishes to believe them or one does not... for no one can know that such things actually occurred. Though many devotees get convinced, the sheer unreasonability of this is obvious to anyone who has a minimum of insight into the nature of human knowledge. Many people are accustomed to believe what they want to despite all evidence, reasons or fact. The following tall fables surpass even the most weird and wonderful biblical stories in fictionality. Ganapati wrote that on 8/12/1973 on a stop with Sai Baba between Prashanthi Nilayam and Brindavan devotees threw stones at a wood-apple tree and brought down one unripe fruit. "Svami bent down and picked it up. Holding it between the thumb and forefinger He said, "Here is the moon"! When He closed His palm over the piece for an instant and opened it again, the fruit was no longer found. Instead an unusual article was in his hand. It was a translucent sphere. The sunlight was gorgeously reflected out of its surface. Though as a whole it was luminiscent there were several dim and even dark spots inside. Multi-hued veins of minerals could also be seen. Superficially smooth-surfaced, it revealed elevations and depressions inside. "The mini-moon, made up of all the ingredients of the moon", observed Baba. Only a few days before, the newspapers had carried photographs of both sides of the moon transmitted by spacecraft. All their features could be precisely perceived in this three-D-mini-moon. More than that, it was refracting the spectrum of colours in sunshine. The party enjoyed the picnic in the glades. Svami held up the mini-moon finally to sunlight. The solar rays glancing off the outer rim sprayed gold. "Do you see the moon rise?" asked Sai, as pleasing as the moon itself. With one more folding and unfolding of His hand, the mini-moon set! It had returned to its old wood-apple birth! (Baba: Sathya Sai by Ra. Ganapati, p. 83f). Svami has performed another fantastic moon-leela. Last year (1975-76), during the course of a jolly conversation with the Whitefield college students one full-moon night, Baba said. 'Ask anything you want'". A daring young student requested, "Please bring down that moon in the sky for us". "Very well", said Baba looking at the sky. The next moment there glowed in His hands a wondrous ball, shedding cool moonlight all around. "Look up" said the Lord. The surprising sight that the students saw on the skies! The original moon was shorn of its lustre and looked pale as a piece of paper! Dear scientist, how do you explain this phenomenon? Baba closed his hands over the earthly 'moon'. At once the anaemic moon regained its regal splendour. As Baba opened His hands once again, the sky-moon became lack-lustre. On his closing his hand, once again the argent effulgence of moon spread up above in the sky. 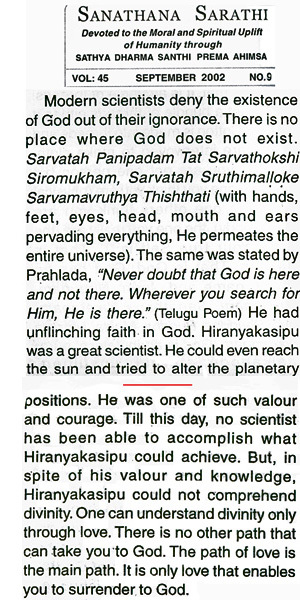 Even if His opponents could not admit that He is the Cosmic Consciousness which created the moon itself, may they not at least accept that the mini-moons, to be found nowhere else, are definitely His creations? (Baba: Sathya Sai by Ra. Ganapati, p. 84f). Obviously, to accept the one is as difficult as accepting the other. Model manufactured mini-moons are doubtless available. They would be easy to palm. Watching for cloud cover and opening and closing the hand as these cross the orb would be easy. No mere student, however 'daring', is going to confront this powerful person who rules as the unquestionable and strict Lord of Creation over them all. Besides, the whole account is evidently at second-hand (or third-hand) and who knows while it is totally uncorroborated by anyone supposedly present. No such 'leela' ever been filmed or observed and reported by independent persons. The students' convenient question could well have been pre-ordered of him by Sathya Sai (it is known from Smt. Vijayamma's book that he often did such things). Or it could simply have been contrived by the first- or second-hand story-teller. Strange that there is no other account anywhere by a witness of this lunatic matter... did not one of them consider this worth recording, or at least telling other Sai Baba writers like Prof. Kasturi about it. Therefore this episode - like most others - will always remain in the realms of fairy stories as far as the world is concerned,and thus figuratively 'anemic and shorn of its wondrous regal lustre'! SATHYA SAI'S DILETTANTISM - 'SAIENCE' INSTEAD OF 'SCIENCE'! It has been shown indisputably in several analyses of his discourses how science-challenged Sai Baba is. He has almost never a good word for science or scientists, or any genuine kind of scholar. He attacks and tries to mock all this on most occasions he speaks of them. Why is this so? Could it be that he realises how far short his tricks and 'blessings' fall of scientific achievements? Is it because he has a chip on his shoulder due to his uneducated mind and ignorance, which he exhibits in so many discourses he gives? He thinks ancient Indian 'knowledge' (mostly superstition anyhow) is far superior in every respect to the amazing advances in modern knowledge into the nature of of matter, nature, the body, mind etc. - all facts unknown to all Indian sages and scriptures. Traditional Indian ideas are well-known to be full of sheer superstitions and absurd remedies that are powerless to cure thousands of ailments that the 'sages' could not even identify. Sai Baba claims that Indian 'mahatmas' like Hiranyakasipu and Ravana (who he also says were demonic due to lack of control of their senses and lusts) had mastered all the sciences, could fly through the power of reciting mantras, and had travelled to the moon and to the limits of the universe beyond all the stars! Moon travel is one thing. But beyond all the stars is a LONG WAY- virtually infinite in extent (ca. ten times as many stars are visible today as there are grains of sand on the entire planet). Becoming a fish to transport oneself through the "hydrospheres" sounds remarkably like a case of severe hunger- or thirst-induced feverish hallucination. Presumably one is expected to admire this Hiranayakasipu's mastery of 'worldly science' as all being done by "rigorous austerity" (ha ha)! So where did this genius tell about the secrets of the atom? Sai Baba certainly doesn't know about much about atoms, as has been devastatingly demonstrated in the article The 'Omniscient ' Sai Baba's massive ignorance of physics exposed' Yet so far Sai Baba, who claims to know all this and more, and who has publicly stated that he will fly through the air, lift mountain ranges etc. etc. has not been seen to do so. So the great avatar, Lord Rama, could not train cows or elephants as Ravana could! How truly interesting! But he trained his wife well, according to Sai Baba, for he made her take the ordeal of fire to prove that she was faithful to him (itself an unbelievable ordeal only believed in by people of primitive ideas). Altogether, Rama's treatment of Sita does not accord with our sense of what it is right to do (dharma). Sathya Sai Baba has compared Rama and Ravana in dozens of his discourses. He is so fixated on Ravana's ' fatal trait', namely uncontrolled lust, that we can surmise what he feels about himself. However, see how much he changes the number of 'categories of knowledge' he says were mastered by Ravana and Rama! SATHYA SAI CLAIMS THAT HE IS ALL THE TEN AVATARS - PLUS "ALL GODS IN ONE"
"Svami is seated on the Chitravati bed with His devotees. The full moon is filling the sky with its cool radiance. Svami has a look at it. Does He think that it looks like His face? Does He further think, 'Why should it not have a dark wig like my hairy halo?' As He moves His fingers here on earth an extraordinary phenomenon takes place in the lunar sphere. A halo appears round the moon, like Baba's tresses! Is that all? The pointed fingers of Baba write something from here on the dark dome. There appears on that heavenly hair-do, the Sankha and Chakra (conch and disc of Vishnu) streaked in lightning. With a further wave of His hand, the conch of lightning dives down into Svami's hand itself and converts itself into a gleaming white shell-variety as of this earth. Svami pours amrit from it in the mouths of more than a hundred devotees. That conch is still enshrined in the Prashanti Nilayam Puja." (Baba: Sathya Sai by Ra. Ganapati, p. 81).